The 2020 Audi R8 receives updated styling and new Decennium limited-edition trim. The R8 V10 also gets 30 more horsepower when compared to the the previous model. Audi is still offering the R8 V10 Performance version with a whopping 602 horsepower. Audi fans, mark your calendars. The 2020 Audi R8 will make its first appearance at the upcoming New York International Auto Show. What better way to introduce the next-generation of Tony Stark’s favorite supercar than in the glitz and glamour of the Big Apple! But to make the event more special, Audi will also feature the limited-edition R8 V10 Decennium. 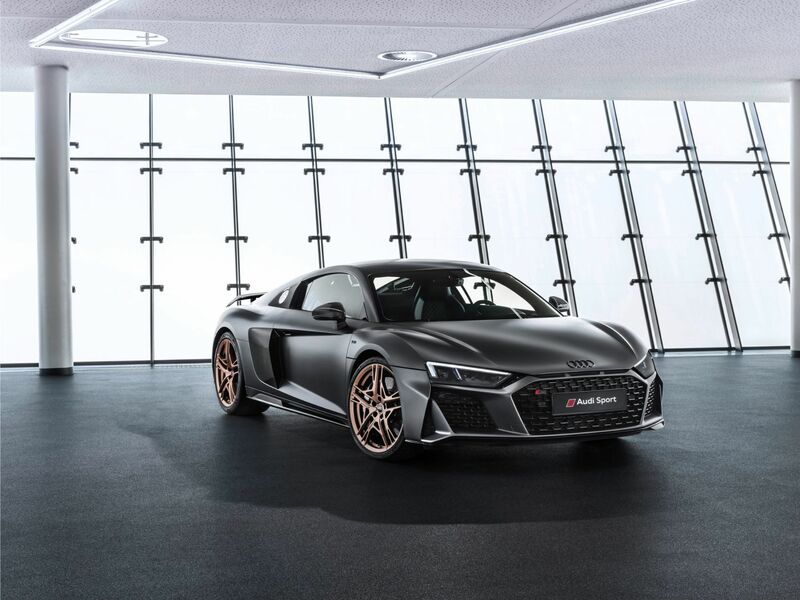 This model commemorates ten years of V10-powered goodness in the R8 supercar, with only 50 units allocated for North American buyers. First, allow me to express my thoughts. The original Type 42 first-gen R8 with the venerable 4.2-liter V8 motor is still the best R8 in my book. It also happens to be the best-looking R8 too. Shame on Audi for killing the V8 FSI motor! There, I said it. Now I can breathe and we can move on. On a different note, the 2020 Audi R8 is morphing into a dapper German car in Italian clothing. It receives an updated front bumper with a new honeycomb grille and an R8 badge. The front also comes with lateral air intakes and new front spoiler lip. Audi also threw in darkened headlights to complete the new aggressive face. I don’t know about you, but the new Audi Singleframe grille is a bit too extreme for my liking. However, the looks are entirely subjective at this point. And to be quite honest, I don’t want my R8 looking like a Lamborghini from afar with all those sharp creases, but that’s just me. Thankfully, things look better in the back. 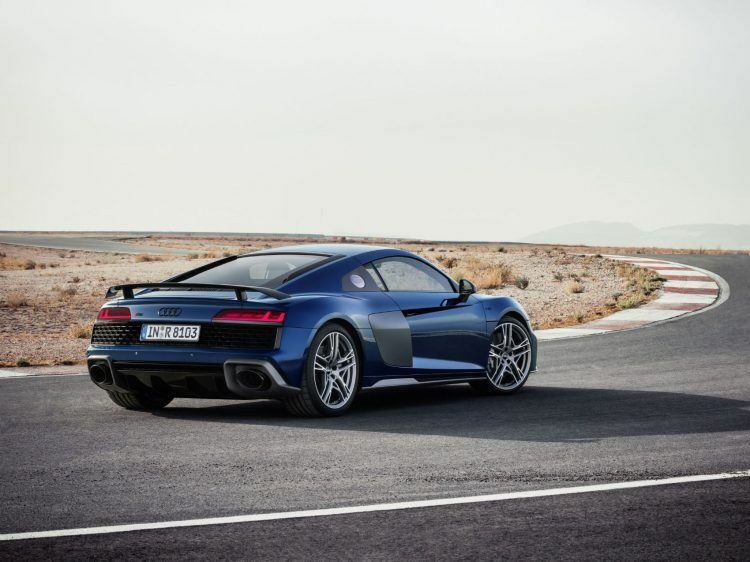 The new Audi R8 gets an updated rear bumper with honeycomb air outlets, a new rear diffuser, and oval exhaust pipes. It also gets 19-inch, double-five-spoke wheels in a bi-color finish. If you think 19-inch wheels are so last year, Audi is offering 20-inch rollers with a 10-spoke Y-design in a high-gloss anthracite finish. The V10 Performance model gets unique 20-inch wheels and forged rims in a titanium finish. The 2020 Audi R8 gets a refreshed face with more aggressive lines and sharper creases. Photo: Audi of America, Inc.
No mid-cycle refresh is complete without adding heaps of power, most especially in a supercar. The new Audi R8 V10 Coupe and Spyder receive a 562-horsepower version of the oversized mill, which is 30 horsepower more than the previous model. With 406 lb-ft. of torque, the car launches from zero to 60 mph in 3.4 seconds (3.5 seconds for the convertible). Top speed is 201 mph (200 mph in the Spyder). 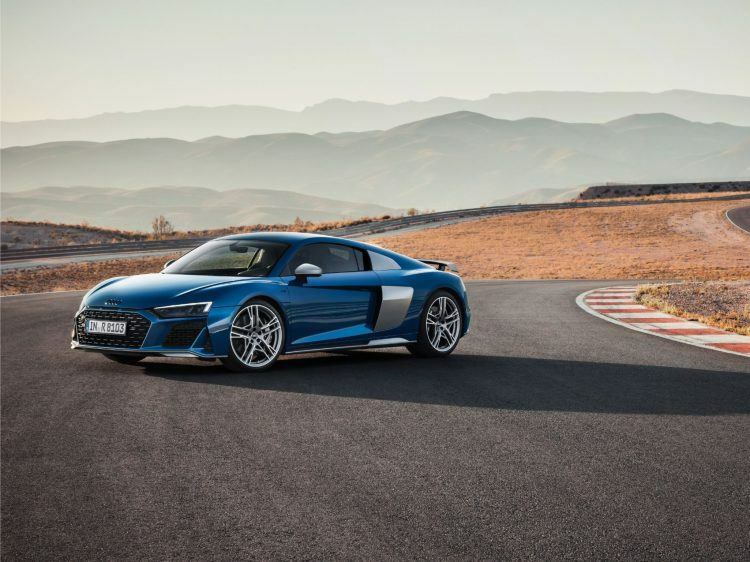 The R8 V10 Performance in both the Coupe and Spyder receive a 602-horsepower version of the 5.2-liter V10 engine. And while this is the same output as the previous R8 V10 Plus, it’s still good for a zero to 60 mph time of 3.2 seconds, and a top speed of 205 mph. Whichever you choose, you get Quattro all-wheel drive and a seven-speed S-Tronic automatic, so the new R8 is still outrageously nippy if you know what I mean. Notice the new top speed? The good news is all R8 models have a top speed of at least 200 mph. Now, this type of velocity is useless in the real world, but it matters in the face of stiff competition from the McLaren 570GT, Acura NSX, and Lamborghini Huracan. The 2020 Audi R8 gets a restyled rear bumper with oval exhaust tips and a new diffuser. Photo: Audi of America, Inc.
Related: A spec by spec comparison of the Audi e-tron GT and the Tesla Model S.
The 2020 Audi R8 receives the Audi virtual cockpit with a fully-digital gauge cluster. It also gets MMI navigation as standard, along with LED interior lighting and a Bang & Olufsen audio system with 13 speakers. You also get the Audi phone box with a signal booster and wireless charger. This feature is included in all models of the new Audi R8. Again, this may sound like I’m nitpicking, but the conventional shift handle looks out of place inside the new R8. If the Lamborghini Huracan gets buttons for the shifter, why can’t the R8 have those too? 2020 Audi R8 interior. Photo: Audi of America, Inc. Celebrating ten years of V10-powered goodness is the V10 Decennium. There are only 222 examples of the Decennium with the last 50 units (numbers 173 to 222) reserved for U.S. buyers. If you think the unique name gets you a more forceful version of the V10 engine, I’m sorry to burst your bubble. And if you want your limited-edition Audi R8 in pearl white, sunburst orange, or blue crystal, you’re out of luck. All 50 examples of the Audi R8 V10 Decennium receive a Mythos black metallic paint job. It also gets the same 602 horsepower engine as the R8 Performance. Want a Spyder version? Umm no. It’s only available in Coupe form. The biggest changes are mostly cosmetic with a plethora of Decennium logos on the inside and outside, and milled 20-inch wheels in a matte bronze finish. The side sills, rear diffuser, and front spoiler have a gloss black finish. The Audi rings and badges are also blacked-out while the side blades, rear wings, and mirror housings have a glossy carbon fiber finish. You also get new door lights that project the “Decennium” logo, and the limited-edition build number on the ground; which is a nice way of saying you own the most special Audi R8 ever as you open the door at night. The limited-edition Audi R8 V10 Decennium has a production run of 222 units globally with 50 units reserved for U.S. buyers. Photo: Audi of America, Inc. The 2020 Audi R8 V10 Coupe starts at $169,900 while the Spyder will set you back $182,100. The V10 Performance version starts at $195,900 for the Coupe and $208,100 for the Spyder. The R8 V10 Decennium starts at $214,995, around $19,000 more than the V10 Performance. All models of the new Audi R8 go on sale this summer.